This affordable airport hotel offers free 24-hour airport shuttle to and from JFK making traveling it the perfect choice for a New York stopover. The hotel is minutes from Yankee Stadium, and well connected to Manhattan and Brooklyn. 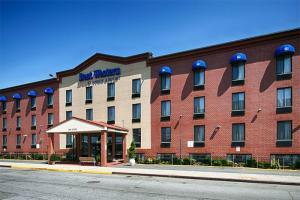 Well-appointed rooms offer free Wi-Fi, coffeemakers, satellite TV, and much more. Start your day off right with a complimentary hot American breakfast including eggs, fresh pastries, fresh made waffles and much more. Located about a mile and a half from JFK Airport.